With my busiest time of the work year upon me, Jen thankfully receives a slight reprieve from her normally busy schedule. This couldn't work out more perfectly. If this was not the case we would be forced to either have Chinese take out for Thanksgiving or have dinner at 1:00 AM. 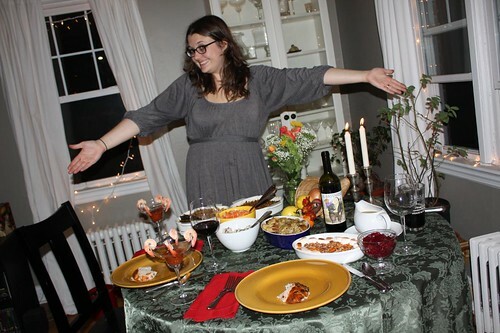 Jen's menu this year was a tremendous success. There was a slight 1950's retro theme to the menu but not overly so. Jen, even more so than me, is a fan of tradition so we couldn't mess with the traditional meal too much. For the past seven years I've been trying to convince her that a whole turkey, even a small one, may be overkill for just two people. Each year that suggestion has been received as well as a lead, fart-filled balloon in church. Our natural inclination is to simply roast sweet potatoes. This year I told Jen to make them Dvorak style(as in tech columnist John C. Dvorak). He roasts them just like us but adds a little butter, cream, and bourbon to the mix. 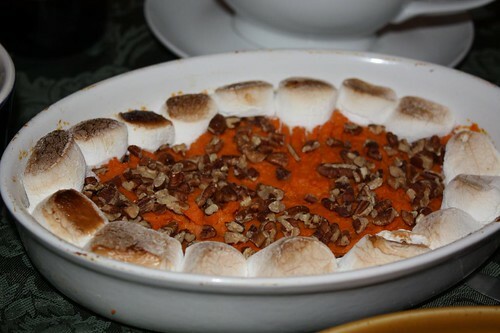 Jen did this along with adding marshmallows and chopped pecans. While I prefer not to add any peripheral sweeteners to already sweet butternut squash or sweet potatoes, this was a fun change to our normal meal. Jen's mother did not see it this way. Instead this only made her sad. 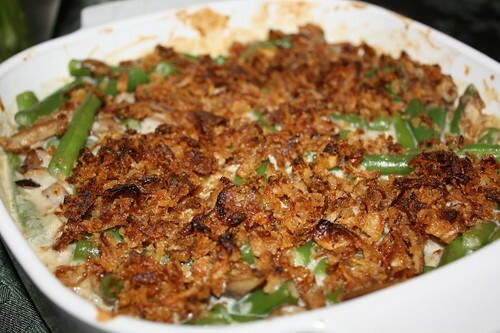 Another thing we never make is green bean casserole. This year Jen made it with an assortment of various mushrooms and crispy onions and it came out wonderfully. Again, not something I'd normally include but it was pretty tasty. 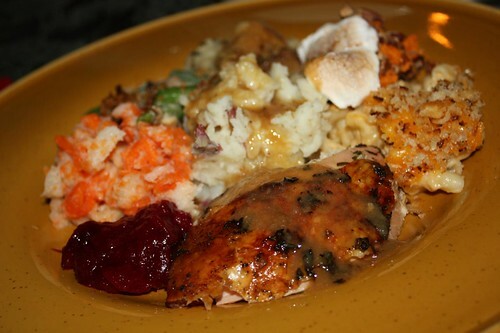 Jen also made macaroni and cheese (not another Jen & Nate classic), mashed carrot and turnip, mashed potato, roast turkey, stuffing (frozen and saved from Canadian Thanksgiving), cranberry sauce (also saved from Canadian Thanksgiving), and gravy (also saved). Jen added a little butter and sherry to the gravy to try something new. This was the only part of the meal that made her sad. I thought it was pretty good. Let that be a lesson to all of you out there: don't ever try anything new. 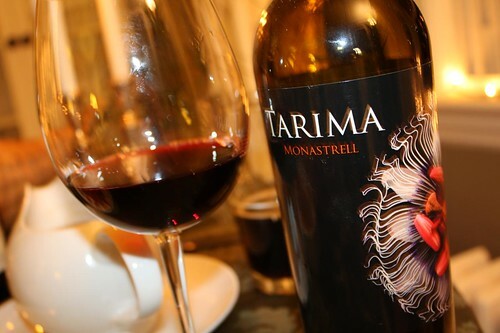 For wine we enjoyed this bottle of Tarima Monastrell. Well, some of the bottle. I'm quite happy with this picture which was taken by accidentally using the wrong settings but ended up turning out far better than I'd hoped. It looks almost like I'm some sort of photographer who knows what I'm doing and this was intentional. I need more mistakes like this. 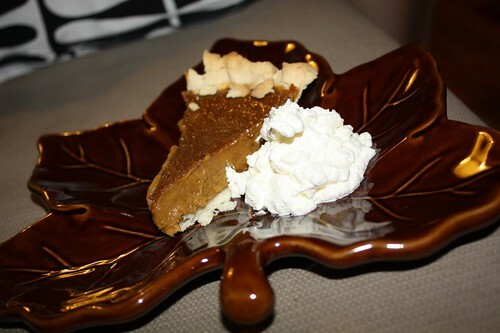 The pumpkin pie was probably Jen's finest yet. 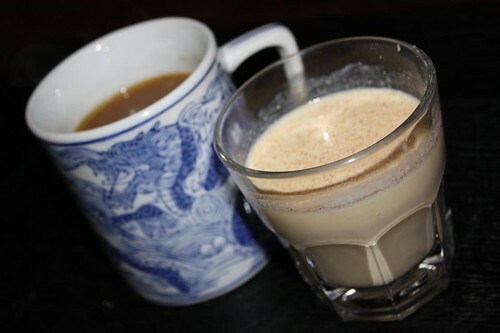 Jen hates eggnog so I made her some hot apple cider with whisky and I enjoyed a nice glass of eggnog with brandy. At this point it was 7:30 PM and after four days of waking up at 5:00 AM I was ready for bed. Jen told me that it was too early so I forced myself to barely stay awake on the couch until 8:30 PM at which point I went to sleep and slept straight through until 6:30 AM and it was the finest night of sleep I'd had in years.